With summer in full swing, I was looking for some good preschooler summer books to share with the kids. I felt like I hit the jackpot when I came across Bats at the Beach. First, it’s about bats — which earns me bonus points with my son. Second, it is a really cute book! As the sun goes down, the bats prepare for their trip to the beach. The night is full of playing in the sand, roasting marshmallows (bat-style), and singing campfire songs, all written in a lovely rhyming scheme. The kids both loved the book immediately. 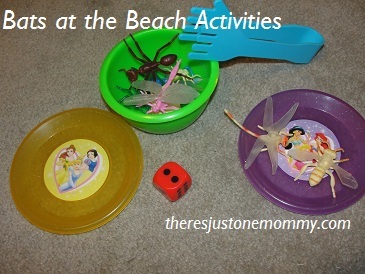 And I couldn’t wait to have a little fun with a few Bats at the Beach book activities. I drew some simple pictures to represent 5 different parts of the story. Then I had them put the pictures in the order that they happened in the book. Next, we dished out some bugs for our bat picnic. They had fun rolling the die to see how many bugs to dish up. I added the tongs to make it a little more interesting and to help work those hand muscles to help with writing skills down the line. 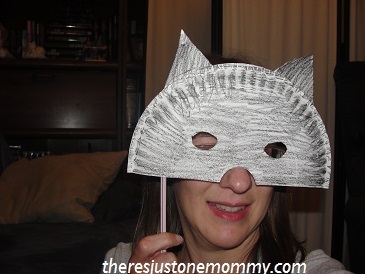 My daughter asked if we could make bat masks… Time to get crafting! 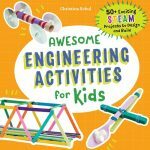 Looking for other activities for bat books? Check out the fun we had with Stellaluna! I can see how this book lends itself to so many wonderful activities. Visiting from Read Explore Learn. It really does! And the story is adorable. What great ideas! My girls would love this book and the activities. The fact that it is about bats creeps me out, but I don’t want my girls to be afraid of bats like I am, so this would be a great book for us. Thanks for sharing the activities, too! That is such a good idea! 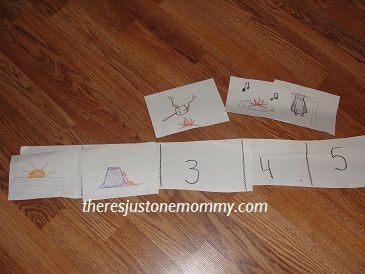 I love the “arrange” the parts of the story activity. We recently read Blackout (pre-school aged book). Do check out our review .. highly recommend it. Also plenty of ideas around the book as well! I will definitely have to check that one out! I used to love bats as a kid (I still do!). I would have loved this activity. So awesome of you. I have to say bats have been growing on me with all the neat bat books we have found at the library and how excited the kids get when learning about them. Some great activities. The bat masks are too cute. Thank you — it is such a darling book! Your sequencing activity looks wonderful. I love the idea of working with story events. Thank you for sharing this post on Read.Explore.Learn. I will be sharing it on Pinterest. 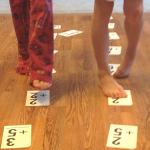 Sequencing is such an important skill for kids to learn with reading! Thank you for sharing it! The bat masks are so cute! I need to check out this book, sounds really cute. I would love for you to share and link up at my weekly TGIF Link Party if you haven’t already this week. Your favorite posts, most popular, recent or new! The party is open every Thursday night and closes Wednesday’s at midnight. Have a wonderful week! Looking forward to linking up this week! Thanks for the invite! 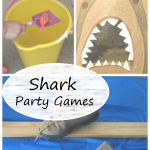 These activities look great! Well done! I am starting a new link-up party this week for all things book and reading related on my blog. I’d love to have you join us with this post and any others you’d like to share. Hope to see you at Booknificent Thursday this week and every week! Thanks so much for the invitation — looking forward to checking it out! I’m so glad you came by and linked up! 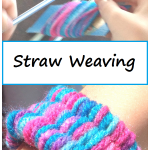 These were really such great activities! Hope to see you again this week! This looks like such a cute book, and I LOVE your activities. What a fun lesson to go with the book. Thank you for sharing at Sharing Saturday! !